Askvoll is another one of IKEA’s furniture series, designed to give style and functionality to your bedroom. Thanks to IKEA, you can customize and design your room to suit your needs and desires, while keeping that stylish look you find on TV. All of that comes at an affordable price because IKEA primarily works on lowering their product prices without compromising quality. Without further ado, we will get into this review which will cover all positive and negative traits of IKEA’s Askvall bed frame. 80% of this product is renewable, meaning it is made of wood, which is a natural and reusable material. The main support beam is made of galvanized steel, as with most IKEA’s bed frame models. The steel support beam adds to the durability and sturdiness of the product. Other materials used to make this bed frame include ABS plastic, paper, particleboard, fiberboard and printed and embossed acrylic paint. This bed frame has adjustable sides, which means you don’t have to worry whether the thickness of your mattress will fit nicely. What goes well with it? As usual, IKEA gave a few recommendations for this bed frame, as to what other products match it best. Most importantly, you will need a mattress if you don’t already own one. For that matter, IKEA recommends the Haugsvar spring mattress that goes for 399$ or the Morgedal foam mattress which is slightly less expensive at 299$. You can choose depending on whether you prefer spring or foam mattresses or which one suits your budget best. Either way, it is important to keep in mind that this bed frame has adjustable sides and, therefore, you can purchase a mattress of any thickness you want. As far as matching furniture goes, IKEA recommends the rest of the products from the Askvoll series, including the Askvoll 2-drawer chest which goes for the price of 39.99$. If you need additional storage in your room, the best recommendation are the Vardo storage boxes that can be stored underneath the bed and go for only 29.99$. The Skorva midbeam that goes with this bed frame is included in the price but has to be picked up from a separate shelf in the IKEA store. However, if you purchase the bed frame online, the Skorva midbeam will be included in the package automatically. Last but not least is the slatted bed base which you will need to complete this bed frame. Unfortunately, the bed base is not included in the price but sold separately. 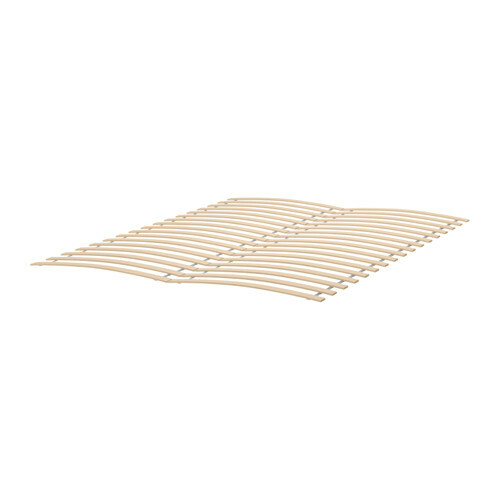 IKEA recommends the Luroy slatted bed base as the best choice for the Askvoll frame. 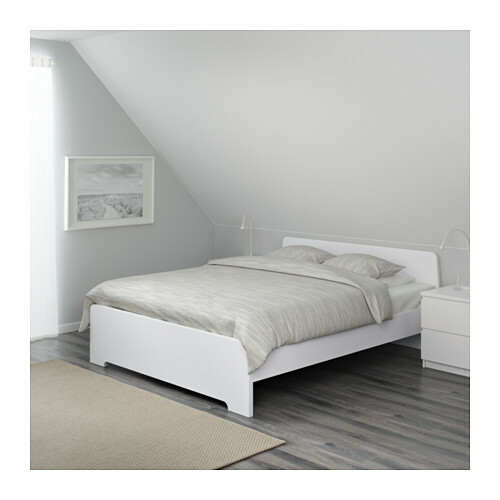 The Askvoll bed frame offers a clean and simple design which opens up many styling possibilities. Its plain design is easy to match with other furniture and different fabrics and colors, in order to meet your desires. IKEA recommends you to put this bed under a window or a sloped ceiling for the best styling results. Lots of natural light in the room will emphasize this piece of furniture and add that minimalist style feel to the space. This bed frame is available in two sizes only, which can be seen as a disadvantage. The available sizes are full and queen size. As far as the prices go, the Askvoll bed frame falls among the more affordable IKEA bed frame solutions. The price for the both sizes is the same and equals to 149$. Keep in mind that the slatted bed base is not included and that will be an additional cost of 50$, which will make the whole frame set around 200$, assuming you already own a mattress. If you don’t, you will have to invest double the money but if you compare IKEA’s bedding solutions to the other ones available on the market, you will realize how much money you’re actually saving. Taking care of the product is as easy as it can be. A simple clean cloth and some mild detergent are what you need to keep this frame good as new. As much as IKEA praises this frame as a high-quality one, there are no customers’ reviews or ratings on the site to confirm its quality. Relying on what IKEA has given us, this bed frame is actually a good and durable bedding solution. It comes in 3 packages, which allows you to cut the shipping prices by transporting the frame yourself. However, you can still opt for IKEA’s shipping service if you want to. The warranty on this bed frame is same as with any other and lasts 25 years. It covers only the manufacturing defaults while the damage was done by the consumer won’t be covered. There is no trial period for IKEA’s bed frame like there is for the mattresses, in case you were wondering. Is IKEA Askvoll Bed Frame Good? Altogether, according to the information, IKEA has given us, the Askvoll bed frame is a good bedding solution if you’re in need of a queen or full size bed. The design is simple and easy to blend with any style you want, which allows you to customize your room the way you want to. The price is affordable and there are no complications in the assembly process, which makes this bed frame a convenient bedding solution! The IKEA Askvoll bed frame is a good bedding solution if you’re in need of a queen or full size bed. The design is simple and easy to blend with any style you want, which allows you to customize your room the way you want to.